C-Thru Smoke Diver Helmet in use by Sweden's Umea Fire Dept. Augmented reality is rapidly becoming a widely available technology in this day in age. 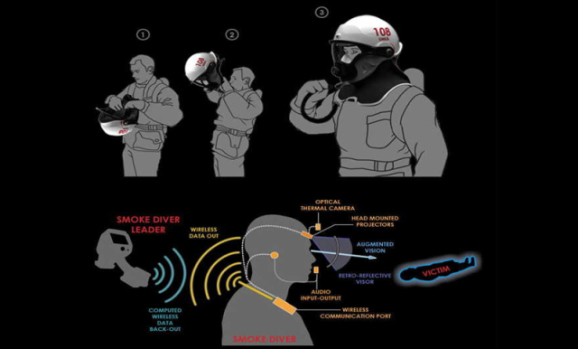 What was once an almost fictional fixture on the silver screen, video games, and television shows, this direct view of the physical environment – whose elements are portrayed alongside computer-generated graphics, sound, GPS, and real-time data – can now be found in devices like C-Thru Smoke Diving Helmet. Developed to aid firefighters during daring rescues in smoke-filled environments, designer Omer Haciomeroglu has taken an innovative approach in his design with the use of a heads-up display that shows vital information and an improved vision in these situations – a technology that is currently only utilized by The US. Air forces. Firefighters must be quick and ready at all times of day or night to combat a blaze. As soon as they get the call, they have very few minutes to get in the truck and get changed on the way to the fire. With an estimated 6 minutes to rescue those trapped inside, these courageous men and women could use all the help they can get. The traditional rescue method involves a team going into a burning building completely blindfolded. Each member must keep track of one another by holding on to their teammates, all while simultaneously checking various devices, and not allowing themselves to be overtaken by the heavy smoke and dangerous surroundings. C-Thru hopes to change that. C-Thru relies on cloud computing to send and receive information from inside the blaze. This includes thermal data that is picked up through the helmet’s thermal-optic sensor, informing Firefighters where the most dangerous zones in building are. The helmet also projects “wireframe data” which outlines the features of a burning interior with a bright outline, even if it’s covered with massive plumes of smoke. 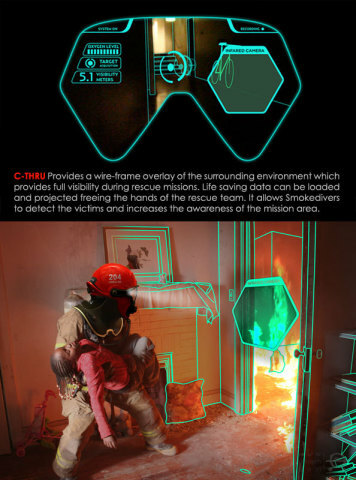 Thus, everything is essentially visible, allowing a rescuer an increased vision when searching for victims in a fire. 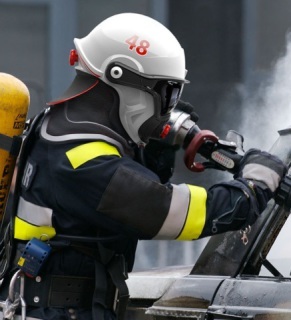 The Helmet also provides a selective noise cancellation feature, allowing Firefighters to focus in on important sounds that can provide an early warning of a collapsing ceiling or doorway. This feature also enhances victim noises and does not interfere with group communication. C-Thru also records the events taking place in real-time, eliminating the “guesswork” in reports and giving the department access to the video for future training missions. The helmet relies on a relay of cloud based information sent from the helm to a wireless device held by the smoke diver leader. Then, the data is sent back projecting the correct wireframe imaging that is overlaid on the front visor. C-Thru also utilizes a wireless audio output, a retro-reflective visor, head-mounted projectors, and a selective audio input. The C-Thru helmet has not officially implemented and is currently only being tested by the Umea Fire Department in Sweden. Nevertheless, combining augmented reality with a dangerous profession like fighting fires is certainly a brilliant idea, and helping out the brave souls that work in emergency services with this kind of technology is not just a benefit to them, but to us as well. Government's 'Love' Stimulus Plan For Valentines!